Russia has set its sights on developing alternative sources of energy in remote areas, despite climate conditions and rich natural reserves. Recently the Republic of Altai launched the country’s largest solar power plant. Other regions have also started to design and build their own solar power plants. Until recently, Russia had been developing solar energy primarily in the space industry. The times are changing, yetthe value of hydrocarbons remains important. Russia seeksto develop solar power in hard-to-access regions with a high level of solar radiation. 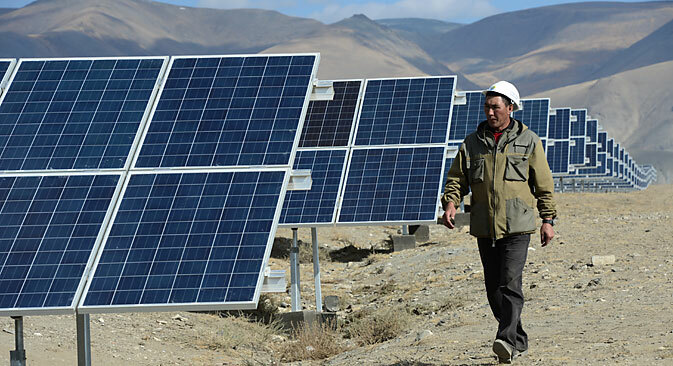 In September, work at Russia’s largest solar power plant was initiated in the village of Kosh-Agach in Altai. This is Russia’s first 5-megawatt (MW) solar power facility. Prior to that, the most powerful facilities were no more than 2 MW. This station is the first of five solar power plant construction projects in the Republic of Altai, which combined will have a 45-MW capacity. Solar power plants are also being erected in the Republics of Khakassia and Bashkortostan, the Orenburg and Astrakhan regions and other areas. “The launch of a solar power plant in the village of Kosh-Agach ushers in a new stage in the development of the Russian energy industry,” Anton Usachev, director of the Association of Solar Power Enterprises, told RBTH. Just five years ago many Russians viewed solar power plant construction projects as nothing but a costly diversion. High production costs, low solar module productivity, long periods of investment return, the lack of a legal framework, and less-than-favorable climatic conditions prevented investors and bankers from putting up substantial sumsto fund these types of projects. Since then the situation has changed radically. It may not seem necessary to develop alternative sources of energy in one of the most hydrocarbon-rich countries in the world. The Russian government continues to trust forecasts asserting that the structure of consumption will not change in the next decade despite rising demand. “The value of hydrocarbons will remain just as important as it is today,” Russian President Vladimir Putin said at the opening of the Kosh-Agach power plant. Solar energy will primarily be developed in regions with a high level of insolation (solar radiation) where the cost of diesel generation is particularly high such assouthern Russian, southern Siberia and the Far East. “Despite its climatic conditions, Russia has every opportunity to create a competitive solar power generation industry,” a representative of the firm Rusnano’s press office told RBTH. According to Alexander Khurudzhi — the chairman of Territorial Grid Organizations, a non-profit association — from the physical standpoint there is a sufficiently high potential for solar energy in southern Russia, particularly the Crimea. However, such projects remain economically viable only in inaccessible areas that lack power infrastructure. The subsidized cost of hooking private households up to power infrastructure is 550 rubles ($14.20) per 15 kilowatts (KW). “Because of its technological particularities, solar energy does not hold any promise for large consumers in the near future,” Khurudzhi added. Kosh-Agach was chosen as the site of a solar power plant because it is one of the sunniest places in Russia, with over 300 cloudless days per year. This will be the region’s very first local power generator. With the help of its new facility, the Republic expects to cut its energy shortage and generate an environmentally friendly form of electricity. The new power plant will guarantee a stable energy supply for at least 1,000 households. Its second phase, also with a 5-MW capacity, will be launched and hooked up to the power grid in 2015. Hevel, a joint venture between state-owned Renova and Rusnano, was the investor in and general contractor for the power plant’s construction. Hevel and the Republic of Altai signed an agreement to develop solar power there in May 2014. By using hybrid systems based on diesel generators and solar panels, remote regions could reduce spending on diesel fuel deliveries and lower the cost of electricity by 30 to 50 percent. In the village of Yaylyu (Altai), for instance, this type of 100-KW unit generated 15,608 KW/h in three months, cutting diesel fuel consumption by more than 12,000 liters. Economic calculations performed by companies that specialize in engineering solar power units indicate substantial financial savings if diesel generation operates in a complex with solar systems and electricity accumulators. Russia has developed more transparent and clear rules for alternative energy in recent years. In 2009 a government order established target shares of renewable sources in overall electricity production and consumption: 2.5 percent by 2015 (around 8 gigawatts) and 4.5 percent by 2020 (25 GW). Over the subsequent several years, a number of amendments were adopted to industrial legislation at the federal level. Russian government resolution #449 and order #861, dated May 28, 2013, identified measures to support the development of alternative energy, similar to the capacity supply contract mechanism for new investment projects in traditional power generation. Under the new rules, a contract is signed with power generation facilities on the basis of alternative energy for a 15-year period, with a minimum 12-14 percent target rate of return per annum. Investment projects seeking support will be selected annually on a tender basis four years in advance. The first tender, held in September 2013, was for investment projects to build a 399-MW solar power unit that will be increased to 1.5 GW by 2020. Now that alternative energy sources are becoming a priority in power generation, major investors are starting to raise funds to transfer advanced technology and improve it in cooperation with Russian scientific organizations. For example, the largest solar module factory in Europe has been built in Russia as a joint project between Renova and Rusnano. Russia’s first and only science and technology center has been up and running in St. Petersburg since 2010. It develops new solar module production technologies for both industrial power plants and spacecraft. Government support for the industry has identified all of the conditions needed to create a successful, profitable solar power business. However, colossal investment in solar power plant construction is required - roughly 150 billion rubles (around $4 billion) by 2020. A lack of long-term, cheap financing will be one of the key constraints to the development of alternative energy in Russia.